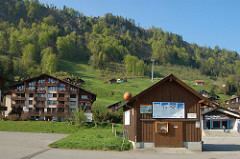 Beckenried is a municipality in the canton of Nidwalden in Switzerland. The first settlers in what would become Beckried were from Alamanni tribes that moved into the area over 2000 years ago. During the Middle Ages the region was part of extensive estates that were shared between Engelberg Abbey, Murbach-Lucerne and Steinen, Switzerland. The two tower houses in the village (named: Retschrieden and Isenringen) were built in the 13th century for two local, influential families. In 1262 the village is mentioned in an agreement over a nearby pasture. In 1314 it is mentioned as Beggenriet. Beckenried has an area, as of 2006, of 24.3 square kilometers (9.4 sq mi). Of this area, 49.2% is used for agricultural purposes, while 36.5% is forested. Of the rest of the land, 5.6% is settled (buildings or roads) and the remainder (8.7%) is non-productive (rivers, glaciers or mountains). 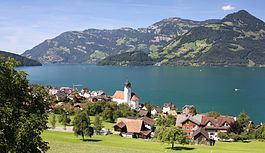 The municipality is a linear village along the shore of Lake Lucerne. It consists of the village of Beckenried with the sections known as Oberdorf, Niederdorf and Dorf. The Beckenried–Gersau car ferry links a terminal in Niederdorf with Gersau on the opposite bank of Lake Lucerne. Beckenried has a population (as of 31 December 2016) of 3,567. As of 2007, 8.2% of the population was made up of foreign nationals. Over the last 10 years the population has grown at a rate of 14.9%. Most of the population (as of 2000) speaks German (95.3%), with English being second most common ( 1.0%) and Serbo-Croatian being third ( 0.8%). As of 2008 the gender distribution of the population was 51.3% male and 48.7% female. As of 2000 there are 1,164 households, of which 761 households (or about 65.4%) contain only one or two individuals. 102 or about 8.8% are large households, with at least five members. In the 2007 federal election the most popular party was the FDP which received 87.7% of the vote. The next three most popular parties were the local small left-wing parties (10.9%), the Other (1.4%) and the CVP (0.1%). The entire Swiss population is generally well educated. In Beckenried about 75.2% of the population (between age 25–64) have completed either non-mandatory upper secondary education or additional higher education (either university or a Fachhochschule). Beckenried has an unemployment rate of 0.85%. As of 2005, there were 156 people employed in the primary economic sector and about 54 businesses involved in this sector. 265 people are employed in the secondary sector and there are 40 businesses in this sector. 557 people are employed in the tertiary sector, with 100 businesses in this sector. The main sights of Beckenried are: the church St. Heinrich and its cemetery chapel, the Ridli chapel, the chapel St. Anna, the Klewen chapel, fun fair (Älplerkilbi), and the St. Nikolas market. 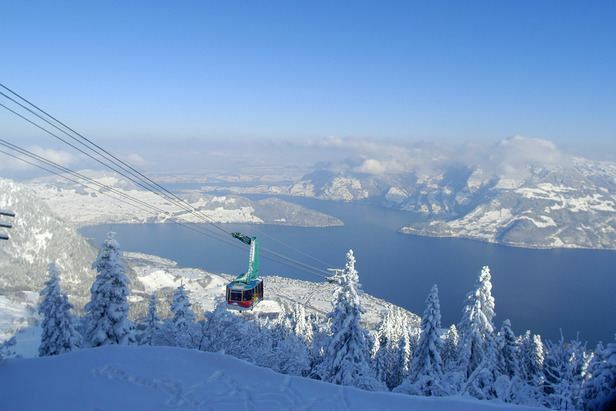 Starting from Beckenried the longest cable car in central Switzerland brings tourists up to Klewenalp, a major holiday resort both in winter and in summer. Beckenried has an unemployment rate of 0.85%. As of 2005, there were 156 people (19%) employed in the primary economic sector and about 54 businesses involved in this agricultural sector. 265 people (32%) are employed in the secondary sector and there are 40 businesses in this manufacturing sector. 557 people (49%) are employed in the tertiary sector, with 100 businesses in the services sector.